The winner of the 2015 Montreux Guitar Competition, Pedro Martins was heavily featured on guitarist Kurt Rosenwinkel‘s “Caipi“, the first for his own Heartcore Records label, in 2017. 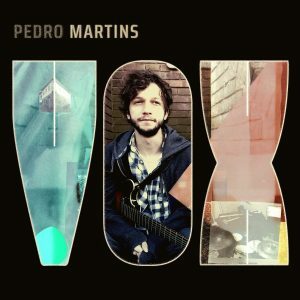 The 25-year old Martins is now releasing his second album, a collection of thirteen Brazilian-flavored pop and rock songs with a heavy jazz input, not only from the label’s head himself, but also from artists such as Brad Mehldau and Chris Potter. There is a similarly eerie and idiosyncratic sound and song quality about this project, more than once reminding me of “Caipi”, with the guitar playing more than a leading role here since both Martins and Rosenwinkel can be heard throughout the album (with Rosenwinkel on four cuts). The shuffling rock rhythm on “Horizonte”, complete with attacking guitar solo and those almost wooden sounding vocals, make way for a more traditional “Vida” and thus, help to make this album a diverting, multifaceted and exciting set. There is something about this production of Michael Franks meets the Pat Metheny Group falsetto vocals and the superb guitar mastering, that really draws me in. Haunting melodies like “B Side” with its catchy hook are standing right next to a wonderfully fragile “Nao Me Diga Nao” which features additional vocals from Oscar Azevedo. Pedro is not only responsible for the guitar playing and the eerie vocals, but also plays piano, synths, bass, drums, percussion, flute and also wrote the majority of the lyrics in addition to composing and arranging most of the tracks. A welcome change of pace and style is the almost instrumental “Verdade” where the guitars are layered upon a synth cushion and the wordless vocals play only a minor supporting role. On pieces like “Venus 13”, the spirit is almost religious, with a trance-like rhythmic pattern which transports both guitar and vocals to another atmosphere. Brad Mehldau plays a twirling solo on “Origem” and with “Sertao Profundo”, the vocals have become too much for me. Maybe a couple less songs would have been more appropriate, but I still find a lot of joy in individual tracks like the album opener “Esqueca” and the final cut, a wonderfully intoxicating and flexible “Quem Eu Sou” which not only should appeal to guitar and Brazilian and vox fans, but to music lovers in general.